Find hotel near Vethalan Kavu Mahadeva Te .. It is one of the few temples in South India that is dedicated to Lord Shiva. Another strange fact of this temple is, here the deity of Lord Shiva is worshipped as Vethala. Though the temple is away from the Alappuzha city, still it has gained popularity because of its serene ambience. Visit the temple during Mahashivratri. This is because, this festival is celebrated in a grand way in this temple. Thousands of pilgrims and visitors come during this festival to offer their praying to Lord Shiva. 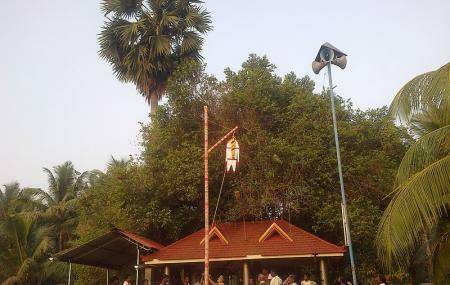 How popular is Vethalan Kavu Mahadeva Temple? People normally club together Sri Mahaganapathi Temple and St George Orthodox Church while planning their visit to Vethalan Kavu Mahadeva Temple. Nothing much to see unless you are an religious guy. Here Vethalam Avatar of lord shiva is workshipped. If you are tourist tring to see places and not a religious person then must avoid to visit to the place.